A Moroccan standby reinvents itself — as Doukkala — with California ingredients and a French chef. The escargot is Doukkala's must-order dish. In the Bay Area, it sometimes seems as if every other restaurant is "Cal" something: Cal-Mexican, Cal-Italian, etc. But with so many restaurants claiming to use local and seasonal ingredients, the designation can sometimes feel meaningless — like a euphemism for expensive cuisine. At the end of the day, it's about a food philosophy, but also about branding. Take the case of Doukkala, a "California-Moroccan" restaurant in Oakland's Temescal district. It was long the home of Tanjia, which served decent, if unexciting, Moroccan food. Business wasn't doing well, and when the founding chef moved back to Morocco, owner Jamal Zahid decided to make a clean start: He hired French chef Eric Lanvert, ditched the nightly belly-dancing performances, and decided to serve a more modern take on Moroccan flavors using higher-quality ingredients — the assumption being that doing so will make for a tastier final product. At Doukkala, most of the food is quite good, although the best dishes are more about cooking technique than the ingredients themselves. Still, the restaurant's Californian sensibility comes across loud and clear, especially in its numerous veggie-centric dishes. The trio of small salads, a staple at traditional Moroccan restaurants, was fairly standard, though the menu somewhat ostentatiously highlights the use of local tomatoes and Mendocino red bell peppers. Those roasted peppers, which were tossed with garlicky, olive-oil-soaked chopped tomatoes, didn't distinguish themselves for having come from Mendocino, but this was easily the tastiest of the three salads. I found the other two — an eggplant "caviar" dip, and a mixture of lightly pickled carrot and cucumber shreds — a bit bland. In terms of entrées, Lanvert's take on pastilla, a kind of meat pie, was another Californian-Moroccan hybrid, striking mainly for the chef's use of quail, which was roasted and braised before being stuffed inside the flaky pastry crust. (Squab is more traditional, but has a gaminess that many Americans don't like, Lanvert explained.) The quail was tender and moist, and mixed nicely with the eggy bits in the filling that soaked up the braising liquid, but the dish wasn't quite savory enough to stand up to multiple sweet components: chunks of anjou pear and a surfeit of powdered sugar. The duck tagine, too, was a rather modern interpretation, featuring two different duck preparations — first the leg meat, cooked slowly in a well-spiced duck broth until the little bits of skin and fat had become quite soft; then the breast, seared medium-rare, sliced, and laid on top with a sprinkling of cracked pink peppercorns — a fruity, tongue-prickling addition. If anything, the dish suffered from having too many components — zucchini, chickpeas, fava beans, pearl onions, green olives, marcona almonds, and probably a half-dozen others. A soupy dish like this begs for some kind of starch to soak up all the meaty juices, and I felt slightly resentful for having to drop $5 for a side of decent, but not exemplary, couscous. That said, this is a hearty dish, and would make for a filling dinner for two if you order it along with a couple of appetizers. Ultimately, the best dishes at Doukkala were the ones that tasted the most French. (Funny how that happens at a restaurant with a French chef.) 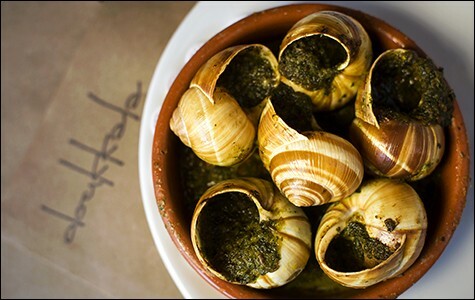 If you aren't squeamish about eating snails, the escargot is a must-order dish. It's described as "Marrakech-style," but street vendors in Marrakech usually serve the snails in a bowl of the aromatic broth that they've slowly simmered in. 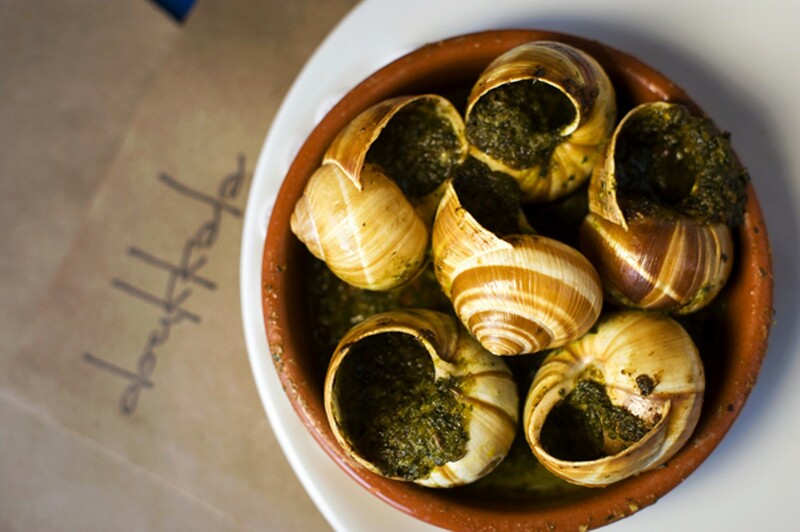 Lanvert braises his snails briefly in a Marrakech-style broth, but the rest of the technique is French: The snails are stuffed with herb-flecked chermoula butter and baked until tender, and the butter melts and forms a deliciously earthy and herbaceous sauce. Also very French, and very delicious, was an entrée of big Pacific sea scallops, which were simply seared and served over a bed of Jerusalem-artichoke velouté — a rich, buttery (though Lanvert said he only uses cream), wonderfully velvety sauce that was flecked with crunchy bits of seaweed and herbed breadcrumbs. Dishes like these wouldn't be out of place at any of the Bay Area's white-tablecloth French restaurants. They (along with a handful of other dishes) were also available as a half-order, which is a boon for solo diners. Doukkala has also started offering a five- to six-course tasting menu that changes frequently. Priced at $65 to $85, plus an additional $35 for a wine pairing, it's nearly as expensive as tasting menus at Plum (R.I.P.) and Commis. Frankly, I'll stick with ordering à la carte — the food, service, and atmosphere don't quite merit the splurge. During my visits the service ranged from smooth and attentive (on a quiet weeknight) to painfully slow (45 minutes for our food to come out, more or less all at once). And while I liked the "tented" effect of the drapes hanging from the ceiling, on the whole it feels like Doukkala still isn't quite sure what kind of restaurant it wants to be. It's not quite formal enough to get dressed up for, but it's perhaps a little stiff for Temescal's younger, hipper set. You don't need belly dancers, but music that doesn't sound like an upbeat electronic-jazz ringtone would help, and perhaps more romantic lighting. After all, the food might be California-modern, but what the restaurant has the potential to be — a great low-key date-night spot — is classic.